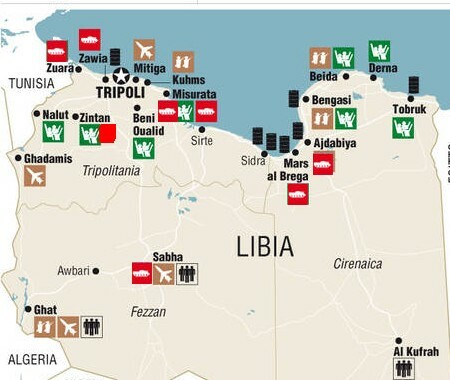 The United Nations no-fly zone over Libya so far extends only over the rebel-held east, especially Benghazi. It seems to stop at Ajdabiya, where fierce fighting is reported. Aljazeera.net says that their correspondent in Ajdabiya, Abd al-Azim Muhammad, reports that the western quarters of the city took tank and rocket fire from pro-Qaddafi forces on Monday, with many homes destroyed. 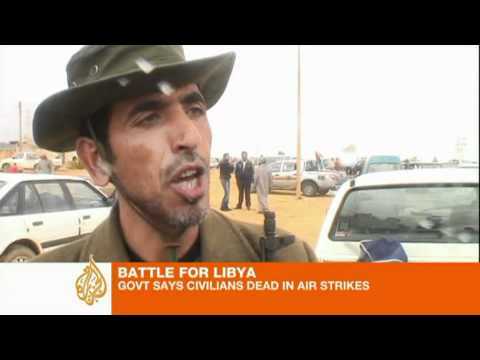 Aljazeera English reports on Qaddafi’s forces in Ajdabiya, who are “in a strong position,” and on the UN allies’ destruction of the armored brigades that had been heading to commit a massacre in Benghazi. I take it that the no-fly zone cannot yet be extended to the West because there are still too many anti-aircraft batteries in and around Tripoli, and the planes of the UN allies would risk being downed. That is why the allies continued their bombardment of Tripoli and of other Qaddafi strongholds such as Sabha in the south. Sabha, a town of about 130,000, is a center of the Qadadfah tribe to which Qaddafi belongs. Under cover of its anti-aircraft installations, the pro-Qaddafi military is waging a fierce battle to take as much of western Libya (traditional Tripolitania) as possible. On Monday, armored brigades launched fierce attacks on Zintan and Misrata. Eyewitnesses told Reuters that 40 pro-Qaddafi tanks had gathered at the foothills near Zintan, and were subjecting the city to bombardment. Civilian homes and a mosque minaret were destroyed. Aljazeera.net reports that Zintan is surrounded on three sides an fierce battles are ongoing between its people and the pro-Qaddafi tank corps. Late Monday, the tanks were firing on dwellings to the south of the city, destroying some of them. The tanks are positioned to prevent ambulances from making a run with the wounded to Tunisia. Many civilians are fleeing the city, some now living in nearby caves, according to Reuters Arabic. Aljazeera.net says that at the same time, rebel sources in Libya have alleged that Qaddafi’s forces heavily bombarded Misrata, which lies west of Tripoli and is Libya’s third-largest city. Jamal Salim of the Libyan Youth of Revolution told Aljazeera that Qaddafi’s brigades opened fire with live ammunition on protesters, killing or wounding “dozens.” Misrata residents told Reuters that “the residents of Misrata went into the streets and into the center of the city unarmed, in an attempt to prevent Qaddafi’s forces from entering the city, when those forces opend fire on them with rifles and artillery.” He added, “They committed a massacre and at least 9 people were killed. Rebel sources also said that Qaddafi’s forces were rounding up civilians from villages near Misrata and herding them with the military convoys as human shields.